Normandy is full of history and has been moulded by the likes of William the Conqueror and WWII. But how many times have you sailed into Caen – just a stones’ throw from Pegasus Bridge, Normandy beaches and World War II history, yet never stopped? We all know that William the Conqueror was the King of England from 1066, but where did it all start? And what makes Normandy the home of the three C’s – Calvados, Cider and Camembert? This isn’t just Normandy – this is historic Normandy and this weekend we will delve into a little bit of everything it has to offer. Check-in at the Brittany Ferries terminal in Portsmouth at 19.25hrs for the 20.40hrs crossing to St Malo. A 3 course buffet dinner has been arranged on board. A 2 bunk inside cabin has been reserved for this overnight crossing. Arrive in St Malo at 08.40hrs. If you didn’t have time for breakfast on board, the beautiful mediaeval walled town is just outside the port and is perfect for an early morning stroll and croissant. Today’s route will give you the opportunity to visit an abundance of typical Normandy places of interest; the cheese village of Camembert, Château de Carrouges, the cider route or a brand new museum in the town of Falais dedicated to the civilians of war. Another option if you wish to choose your own route would be to visit the neighbouring region of Loire and visit Le Mans – a town that is very often bypassed to en route to somewhere seemingly more attractive, but there really is more to this town than just the 24hr race and with the museum at the circuit entrance and the old Plantagenet city, it is definitely worth a visit. Today will offer a scenic drive through Suisse Normande, an area that has been carved by the Orne river and created dramatic meanders and gorges into the rocks of the area. The highest heights in these parts reach over 1,000 feet, making for ideal driving routes for exploring these riverside villages and low lying hills. After a breakfast, we bring another level of history to this insightful weekend. You have all day to visit the Ducal Palace in Caen. Built by William the Conqueror in 1060, this is one of largest medieval enclosures in Europe and contains the Normandy Museum and Fine Arts Museum. Alternatively, you could make your way to Bayeaux with its beautiful Cathedral and the famous tapestry, then follow the coast road taking in some of the WWII memorials. Head back to the port in Ouistrehem in time for the 23.00hrs departure back to Portsmouth. A 2 bunk inside cabin has been reserved for this journey. Arrive in Portsmouth at 06.45hrs for the journey home. 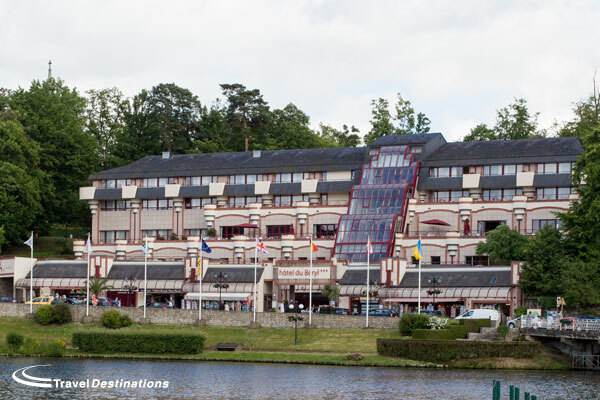 The Hotel du Beryl is a 3 star spa hotel located on the shores of Lake Bagnoles near the Andaines Forest.